I’ve been browsing flowers and plants for a few weeks and succulents have made it to the top of my list. Fabian actually mentioned them to me and then Annette agreed that succulents would be a marvelous addition to our wedding. Our venue has an absolutely AMAZING view that consists of tons of flowers; there is even a greenhouse on site. One of the reasons we chose Falkirk is because of its natural beauty. There is really no need to add to the outdoor scenery; the foliage is colorful and really beautiful. 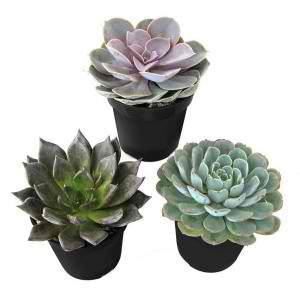 Fabian, Annette, and I figured that succulents would be a good way to add extra greenery and color without taking anything away from what the area around the home has to offer. Another plan we have? Growing and planting our own succulents. I have a few friends (Hi, Mieshia! Hi, Natalie!) who are willing to house succulents for me at their own homes (I have some great friends!) and I’ve been on a mission to find my inner green thumb. Top Left Source Unknown, Top Right Petals of Love my florist, Annette Herras, Bottom two my yard! While driving past a block yard sale on Saturday I saw some plants for sale. I pulled over and had the pleasure of meeting a lovely woman by the name of Donna. I explained to Donna my recent fascination with succulents and she was happy to answer my questions. In addition to the 4 plants I bought from Donna she gave me an additional three plants, she handed me her business card, and invited me to come to her house to see the rest of her plants (she is the chair of the Bakersfield Cactus and Succulent Society!). I’ve also browsed Craigslist and many people offer free clippings of their succulents. Nice. 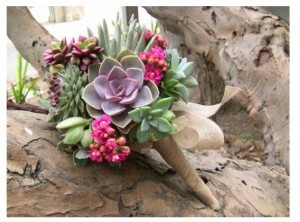 I know that I want succulents mixed with flowers for my bouquet (I love the above bouquet) because I want to replant the succulents in our backyard; I want Brandon and his best man to have a succulent boutonniere, and I want succulents aligning our long banquet tables (we are having family style dining). 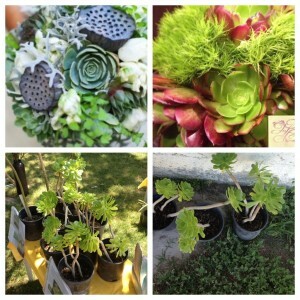 I am also considering lining our wedding aisle with potted succulents. I haven’t quite decided if I want our wedding favors to be succulents, but it has crossed my mind. 1. Come in a variety of types and colors. A quick Google search will bring up hundreds of succulents! 2. Can be planted indoors or outdoors. 3. Do well in dry areas; they are a desert plant. 4. Are easy to replant. What are your favorite kinds of plants and flowers? How will you go about picking the flowers for your wedding? 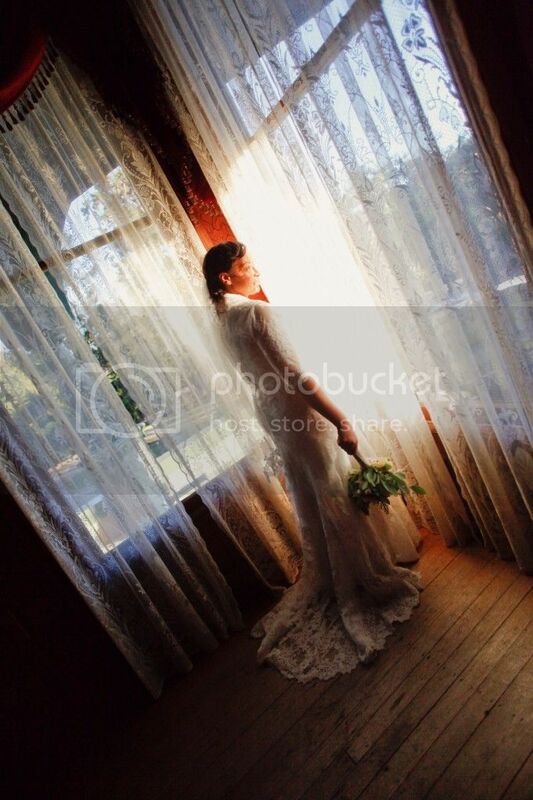 How did you choose the flowers for your wedding? Succulents are a great idea. Sturdy and don’t need to be sitting in water all day. :) You could consider using the same succulents you are thinking of using on the banquet tables as giveaways. Kill two birds with one stone. You read my mind! That’s exactly the plan.